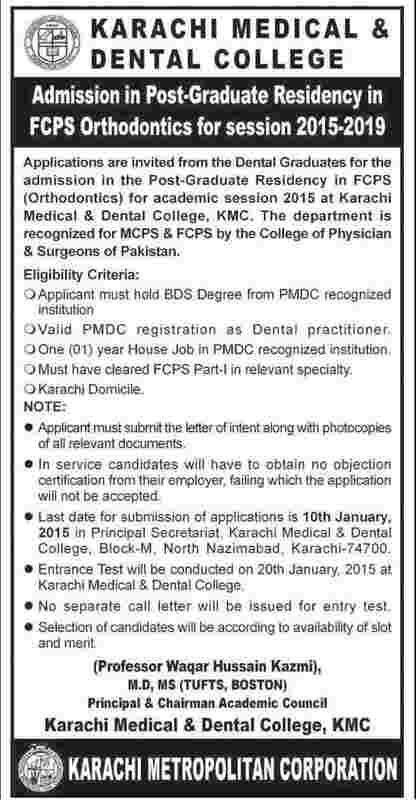 Applications are invited from the Dental Graduates for the admission in the Post-Graduate Residency in FCPS (Orthodontics) for academic session 2015 at Karachi Medical & Dental College, KMC. The department is recognized for MCPS & FCPS by the College of Physician & Surgeons of Pakistan. Valid PMDC registration as Dental practitioner. One (01) year House Job in PMDC recognized institution. Must have cleared FCPS Part-I in relevant specialty. Applicant must submit the letter of intent along with photocopies of all relevant documents. In service candidates will have to obtain no objection certification from their employer, failing which the application will not be accepted. Last date for submission of applications is 10th January, 2015 in Principal Secretariat, Karachi Medical & Dental College. Block-M, North Nazimabad, Karachi-74700. Entrance Test will be conducted on 20th January, 2015 at Karachi Medical & Dental College. No separate call letter will be issued for entry test. Selection of candidates will be according to availability of slot and merit.